The IRS-5300 Series Forms module provides you with a comprehensive resource for all your IRS and PBGC Forms. Avoid manual data entry. Import information directly from plan documents. Fast. 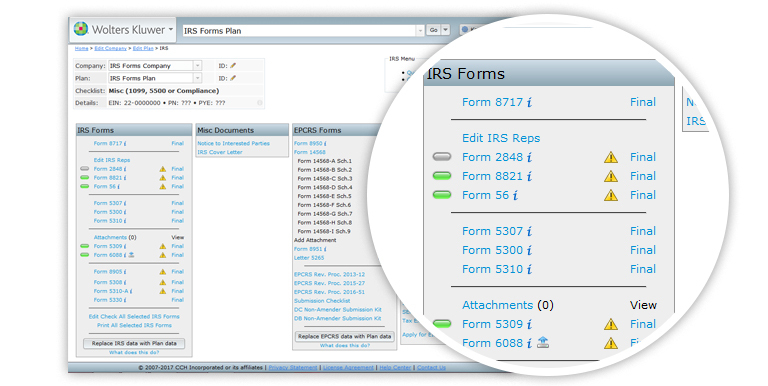 Create .pdfs of final IRS forms to email to clients. Extensive online error correction. Check for accuracy with extensive error checking and context-sensitive help buttons. New! Batch 8905. Available for Cash Balance Plans. * Form field data are not maintained on the Wolters Kluwer Legal & Regulatory US servers. You may save the form with the form entries as a .pdf file on your local drive. Most of these forms were obtained from the IRS website.